Platte County sophomore Gracie Erickson (3) slaps hands with junior Janessa Barmann (4) after Erickson scored a run in the third inning Thursday, Sept. 21 against Raytown South at Platte County High School. The Pirates won 15-0 in three innings. The offensive attack can start at any time with what veteran Rob Davenport calls the best hitting team he’s ever coached. Platte County showed off its potential with a pair of big outbursts in what ended up a 15-0, three-inning victory Thursday, Sept. 21 at Platte County High School. The Pirates scored seven in the second inning — all with two outs — and added eight more in the third. Platte County junior first baseman Shayla Kohler hits a pitch against Raytown South on Thursday, Sept. 21 at Platte County High School. She helped the Pirates to a 15-0 win. Grace Heater provided the walkoff single, preserving Platte County freshman Emma Koeneke’s perfect game. The Pirates scored seven or more runs in 14 of 20 games during a 16-4 start to the season. Platte County loaded the bases with two outs in the first inning but went without a run. The bottom of the second started with two outs on two pitches before a lengthy rally started for the Pirates. A freshman second baseman, Maddie Carter singled and scored on sophomore Paige Rocha’s single to center field and the first of six errors on Raytown South. In total, 10 batters came to the plate with Kohler hitting a double to center field to score two followed with RBI singles for sophomore Gracie Erickson, freshman Halle Magee and junior Janessa Barmann. In the third, Koeneke set Raytown South down in order for the third straight inning, and Platte County ended the game with eight runs. Platte County freshman Emma Koeneke delivers a pitch in the second inning against Raytown South. Taylor Farr, the Pirates junior center fielder, hit an RBI double, and Kohler followed with a single. The Cardinals made three errors in the inning, and Carter’s single scored Barmann to make it 14-0. With two outs, Heater lifted a single to left field, allowing Koeneke to score the winning run. In just three innings, Koeneke struck out three and needed just 24 pitches to retire nine batters. With no seniors on the roster, Platte County had won 14 of 15 since a 2-3 start to the season in the Greater Kansas City Classic. The lone loss was 4-3 to Kickapoo during a recent trip to the Ozark Fall Festival. Platte County made some switches while adjusting to its youthful lineup with Carter moving over to second base from shortstop, and Magee moving from catcher to take over at shortstop. That’s put Hayden Humes behind the plate, catching for Koeneke and Erickson. 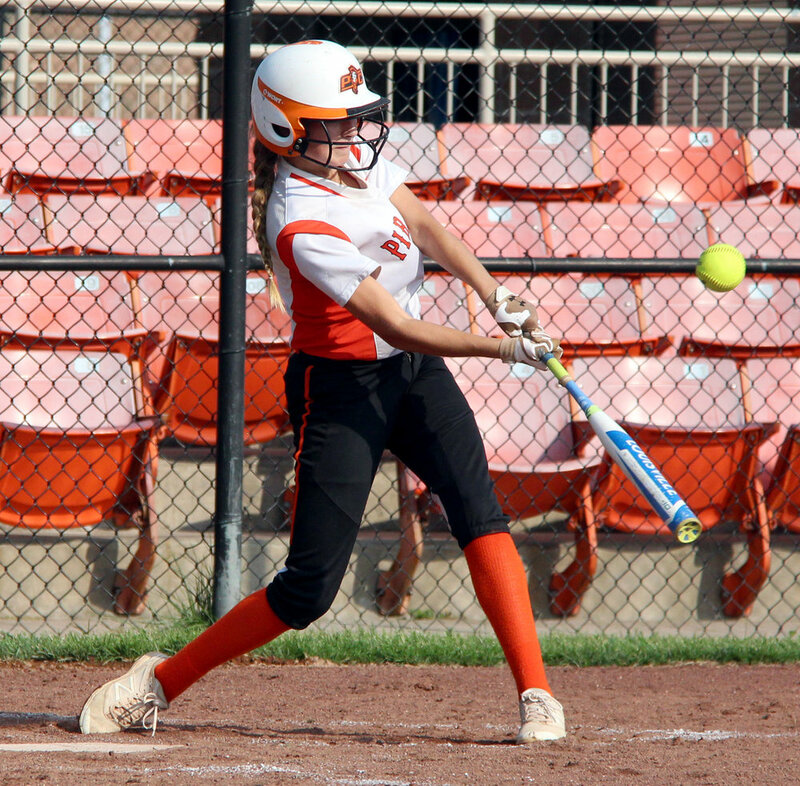 Platte County sophomore Paige Rocha follows through on a swing against Raytown South on Thursday, Sept. 21 at Platte County High School. While the defensive alignment took some configuring, the lineup quickly gelled. Platte County held a .380 team batting average entering a scheduled Tuesday, Sept. 26 Blue Division matchup with Belton. Rocha leads the way from the leadoff spot with a .532 average, 18 extra-base hits, 21 RBIs, 28 runs scored and 13 walks. However, Davenport credits the strong junior class with deepening the lineup. Stephanie Carroll has become a dangerous slap-hitting left-hander in the No. 2 spot with Farr (.460 average, 10 doubles, 21 runs, 17 RBIs) and Kohler (.369 average, 15 RBIs) developing into key run producers. Erickson, the main starting pitcher as a freshman, been a factor at the plate and ranks tied for second in RBIs with Farr. Barmann, another junior, has a .418 average for Platte County in the bottom third along with freshmen Magee and Carter. Koeneke improved to 12-1 on the season with the win over Raytown South. 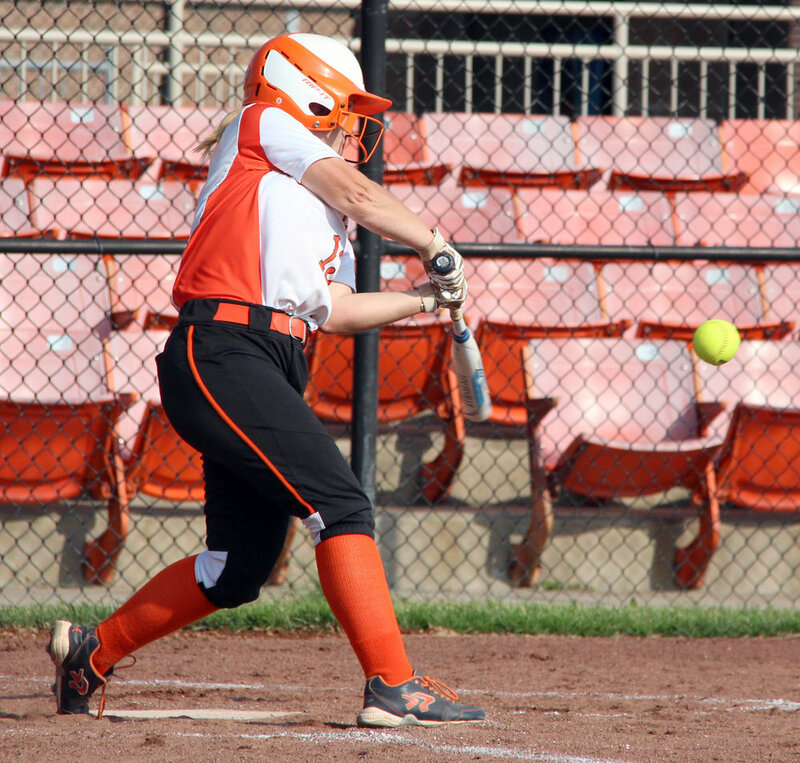 Platte County junior outfielder Taylor Farr hits a ball in the first inning against Raytown South. With Erickson dialed back some, Koeneke quickly developed into the main option with 11 starts and eight relief appearances. She also has a save and has struck out 58 in 80 innings while walking only 20. 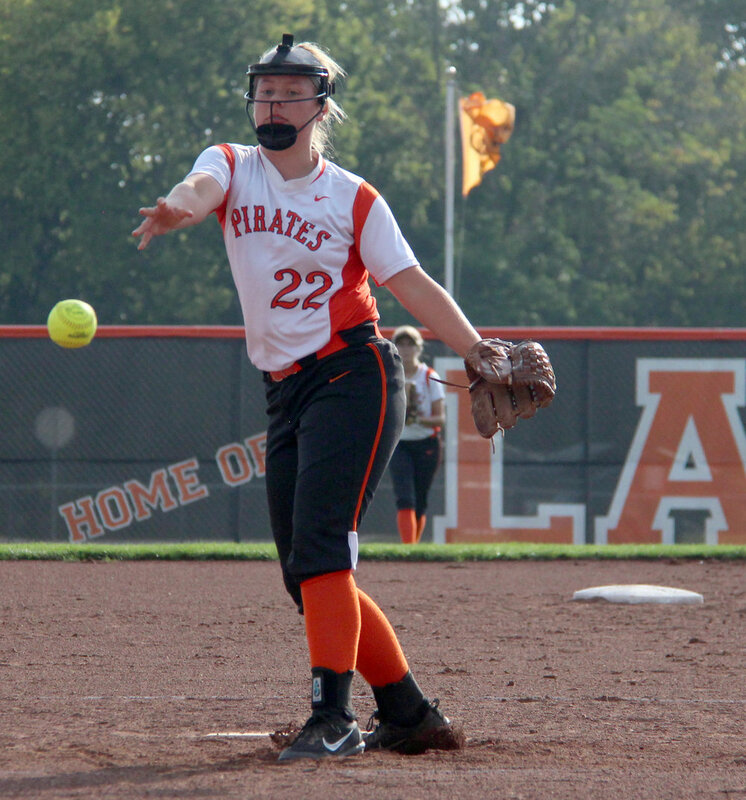 Platte County’s pitching hasn’t been overpowering, but the offense’s production has been plenty to back Erickson’s steady presence (nine starts, two saves in five relief appearances) plus Koeneke’s quick maturation. Platte County held an 8-0 record in conference needing wins over Belton and Kearney on Wednesday, Sept. 27 to win the title again. The Pirates will also be seeking a return to the Class 4 District 15 title game, looking for the first playoff appearance since finishing as Class 3 state runnerup in 2014. A six-inning top of the sixth helped the Pirates stay unbeaten in Blue Division play and avoid an upset Wednesday, Sept. 20 in Kansas City, Mo. Platte County had 15 hits total but trailed 2-0 after the first and 3-1 after the third. Heater scored on the back end of a double steal attempt that also resulted in the third out in the top of the fourth, trimming the Pirates’ deficit to 3-2. The big inning started with one out. Erickson singled and Barmann walked before Koeneke singled to score the tying run. Carter followed with a two-run single, and Rocha tripled her home to make it 6-3 Platte County. Rocha was thrown out trying to score on a grounder, but Magee, Kohler and Farr hit three straight two-out singles to plate the final two runs for the Pirates. Koeneke threw three innings of shutout relief to earn the win, retiring six of the final seven batters.